ANGOLA, Ind. -- Mount Union's men's volleyball team lost a pair of matches against North Park (Ill.) and Concordia University Chicago at Trine University Friday night. Against North Park (1-2), Mount Union fell 23-25, 25-20, 25-22, 14-25 and 17-19 in five sets. The Purple Raiders (0-4) were led by sophomore outside hitter Justin Sibbel's (Stow/Stow-Munroe Falls) 20 kills. Freshmen hitters Mark Bruns (Columbus/Upper Arlington), Kaleb Krebs (Pittsburgh, Pa./Seton LaSalle) and Sam Matonis (Macedonia/Walsh Jesuit) also came up with double digit kills; Bruns with 17, Krebs and Matonis with 11 each. Freshman setter Jeremy Leyden (Cuyahoga Falls/Archbishop Hoban) led the team in assists as he accounted for 53 of Mount Union's 62 total assists in the five-set match. Defending for the Raiders was sophomore libero Andrew Chen (Brooklyn City, Minn./Park Center Senior) with 14 digs while Bruns and Matonis each collected a pair of blocks. Against Concorida (2-0), Mount Union lost in straight sets by scores of 20-25, 21-25 and 19-25. Bruns led the squad once again, this time with eight kills. The Raiders had 24 kills in the match as 22 of them were assisted by Leyden. Leyden also landed three services aces. An array of Raiders dug up balls in their second match of the night but Chen remained the leader with five digs. At the net, Bruns, Leyden, Krebs and senior outside hitter Jordan Spurling (Columbus/Groveport Madison) all registered two blocks. 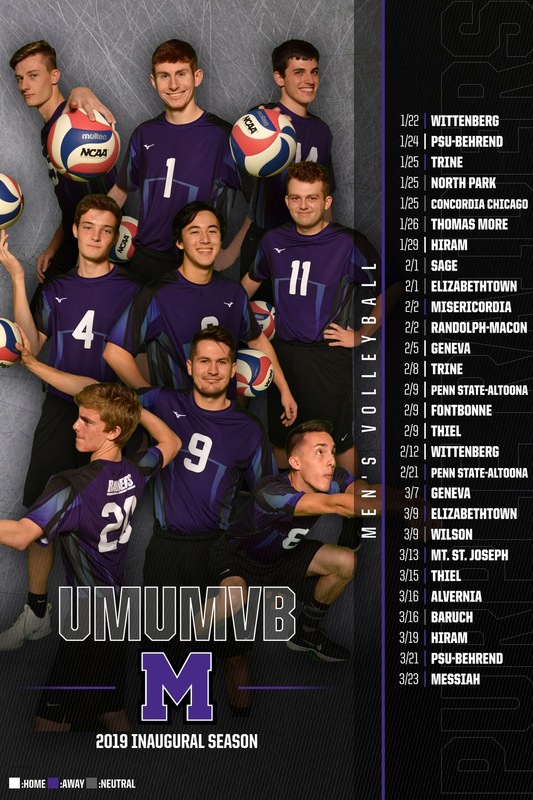 Mount Union continues play Saturday, January 26 with matches against Thomas More (Ky.) at 11 a.m. and host Trine (Ind.) at 1 p.m.